A desire to help preserve our culture prompted Carol Axtman to begin volunteering at the Cultural Heritage Center in 2006. Carol’s family history includes ancestors from England and Ireland. Her mother’s family came from England in 1623. Her father’s family came from Ireland in 1846. Her parents met in Yale, a town near Huron. Carol spent most of her growing-up years in Columbia, a community near Aberdeen. Carol graduated in 1957 from the secretarial program at Presentation College in Aberdeen, which at that time was a junior college. “It was a good program. I had some good jobs in secretarial,” Carol said. Her work history includes working for the Legislature, the South Dakota Indian State Government Task Force, state government and the state retirement system. 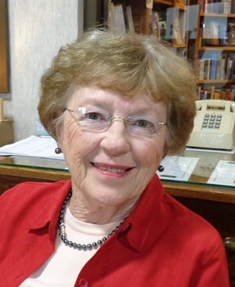 She had her own financial adviser business with American State Bank for 11 years, retiring in 2006. While working, Carol saved her vacation time and went to college during the summer. She received her bachelor’s degree in 1978 from Northern State University and her master’s in business administration from the University of South Dakota in 1981. “I would be one of a very few women in business classes,” she said. The young men who were her classmates benefitted from Carol’s real-life experience in business. She met Seb Axtman during her freshman year at Presentation College. They were married the summer she graduated from Presentation, in 1957. The Axtmans have four children: Timothy, who lives in New Orleans, La., Gregory, who lives in Harrisburg, Pa.; Susan, who lives in Fargo, N.D.; and David, who lives in Sioux Falls. The Axtmans have nine grandsons and one granddaughter.